You are here: Home / Health / Why Should Men Do Yoga? (ThyBlackMan.com) Every person seeks yoga for a different reason. Many men feel like it’s a women-only activity, and that couldn’t be further from the truth. For some, it’s a way to physically connect with your emotional health. It’s a way to deal with any anger, frustration, or stress in a physical way that doesn’t require anyone else’s help. It’s a solo activity that you happen to do around other people, or alone. Finding a space you can passively deal with your thoughts is a healthy way to process emotions. 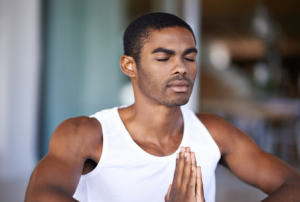 Some men start practicing because they need the physical and health benefits that yoga provides. Increased flexibility, lowered blood pressure, rehabilitation for old injuries, clearing the mind – you name it, and yoga can help with it. There are strong communities built from practicing yoga with the same group of people. The positive social effect that builds from this community is needed, even by men who think they’re ‘loners’. Social contact is important for balance, and the kind of space people give one in a yoga community helps many men slowly connect to other like-minded people. There’s a comfort zone that starts to build when you get used to the same faces going to yoga classes regularly. There are amazing benefits to the practices of breathing and relaxation techniques that are learned from practicing yoga. These practices definitely translate into the bedroom. Being able to focus your mind can help you better concentrate and channel your sexual energy, which in turn can increase your connection with your partner as well as heighten sensations. The spiritual aspects of yoga can be sought out, but if you aren’t into hearing about chakras and opening heart centers, you don’t have to. It’s possible to find classes that avoid these subjects entirely. Likewise, you can seek out classes that are all about these yoga characteristics. There are so many possible reasons why men should do yoga. What draws you to yoga?